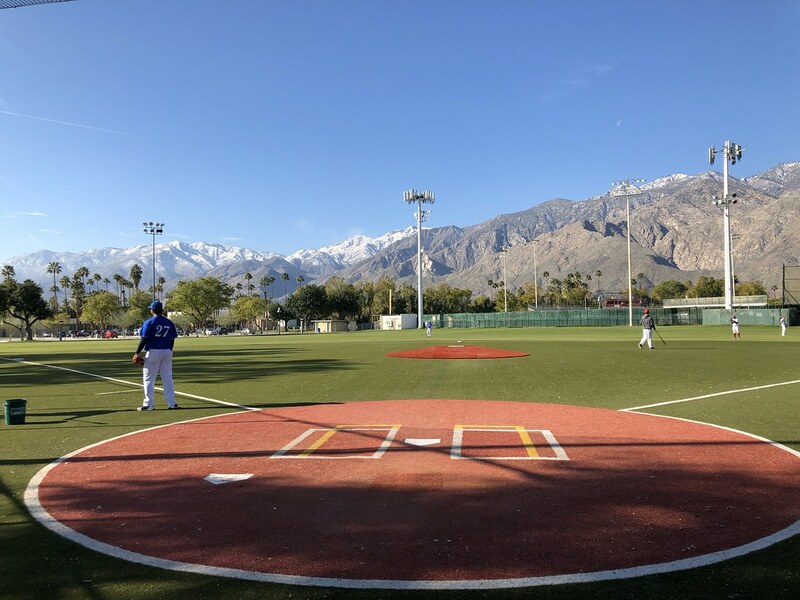 The view from behind home plate at Palm Springs Auxiliary Field. 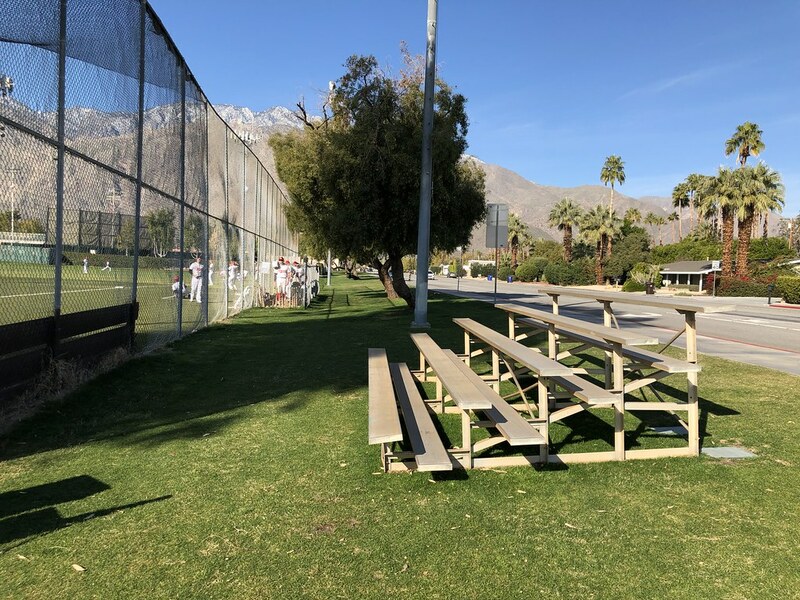 The only spectator seating at the Palm Springs Auxiliary Field is a very small section of aluminum bleachers on the first base side of the field. 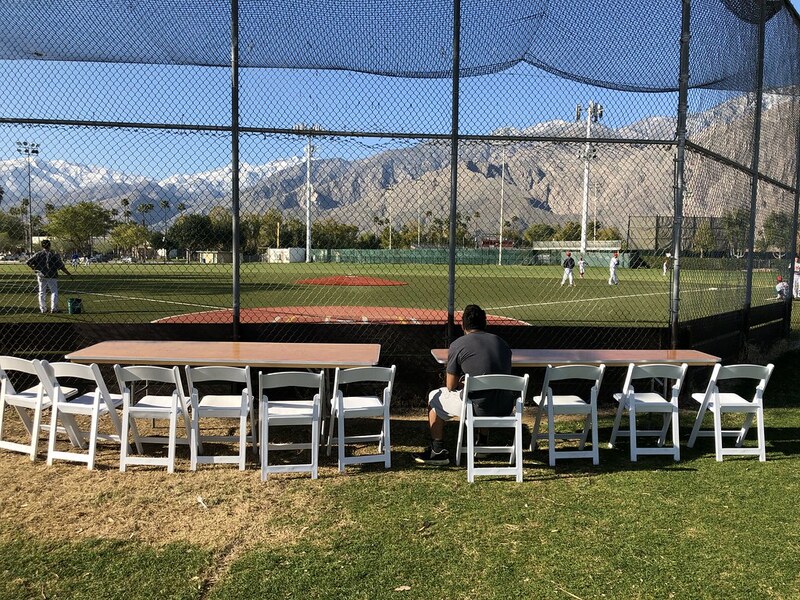 The "pressbox" is a set of folding tables and chairs set up behind the wooden reinforced backstop. 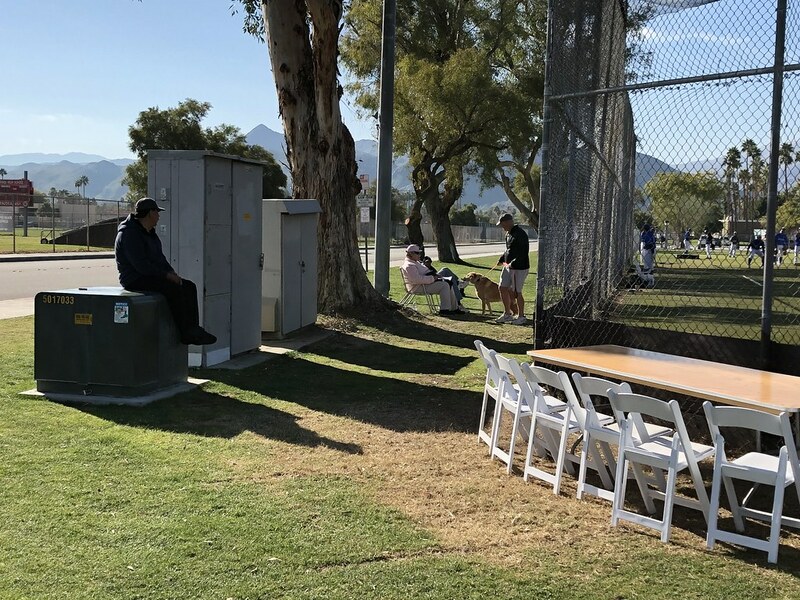 Fans watching games at the field set up their own chairs, as well as sitting on the electrical transformer boxes behind the backstop. 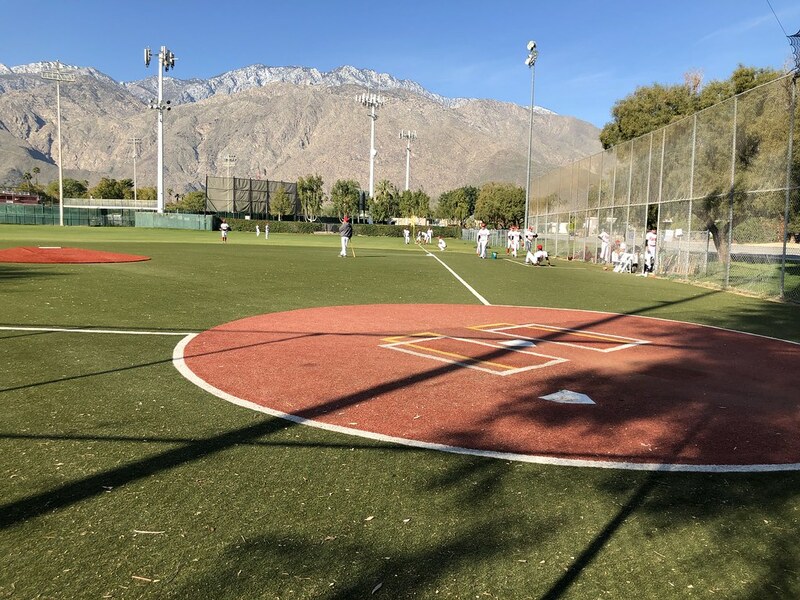 The dugouts are made of the same chain link fencing that surrounds the playing field. 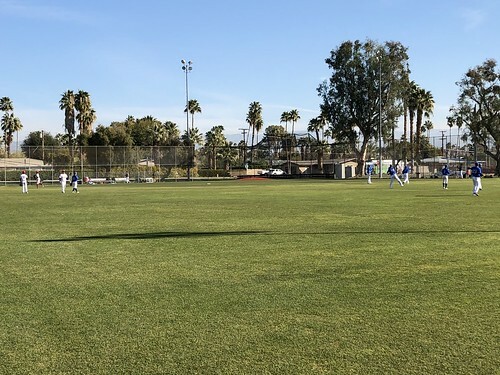 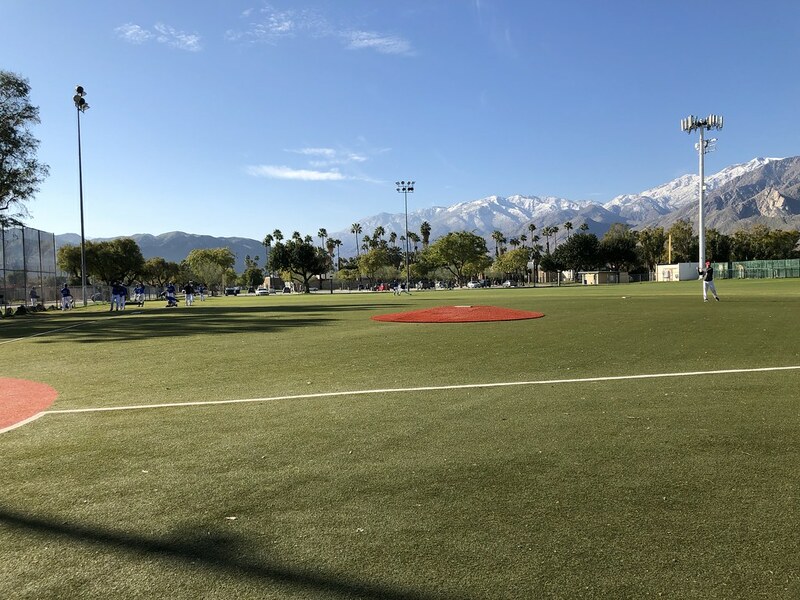 The playing surface at Palm Springs Auxiliary Field is artificial turf on the infield, with a removable mound, and natural grass in the outfield. 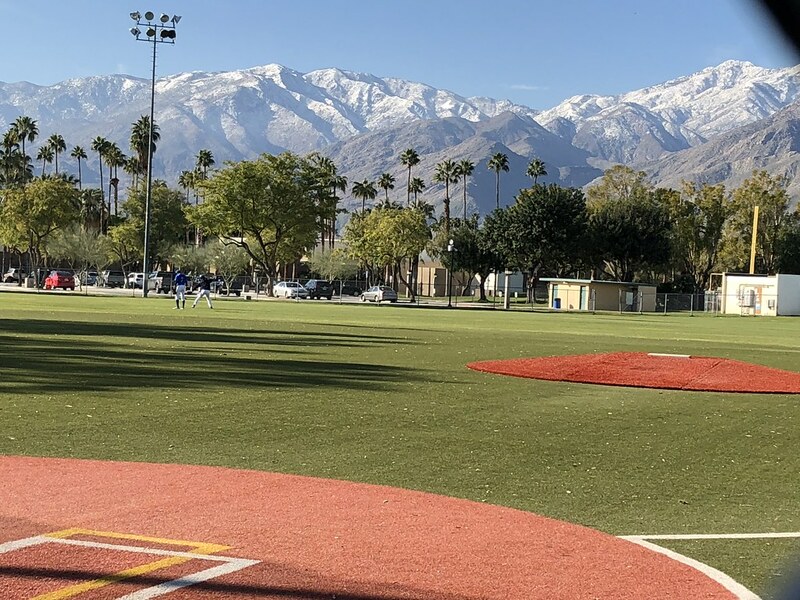 Though the facilities are sparse, the field features a fantastic backdrop of palm trees and snow covered mountains. 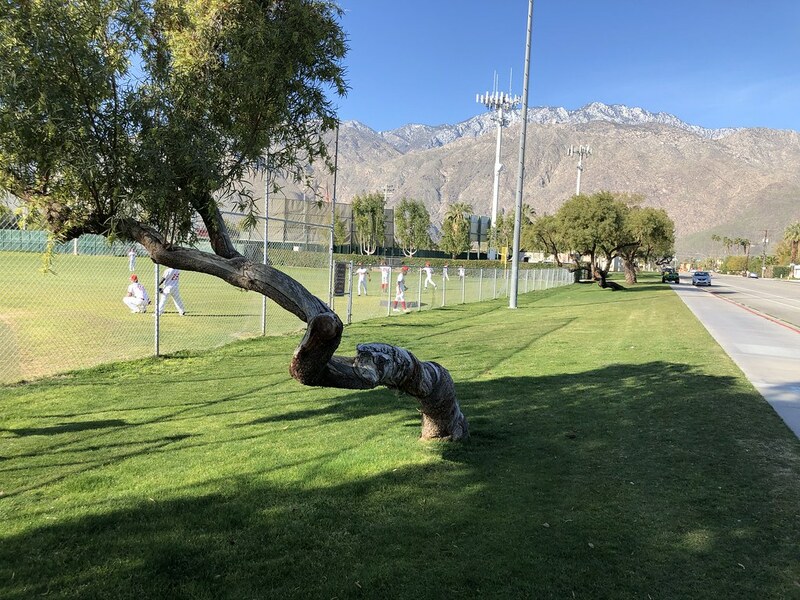 Trees line the grassy area beside the field. 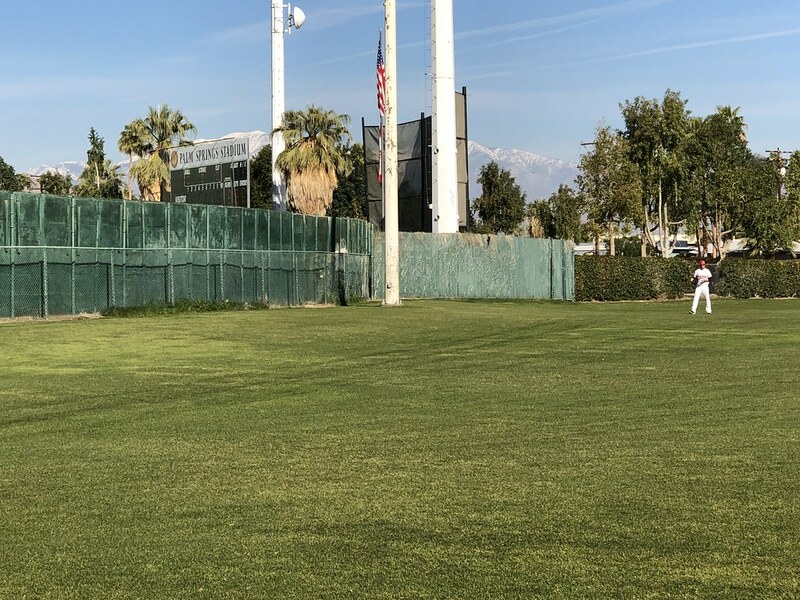 The light towers for the adjacent Palm Springs Stadium are in play in the outfield, and the stadium's right field fence acts as the left field wall for the auxiliary field. 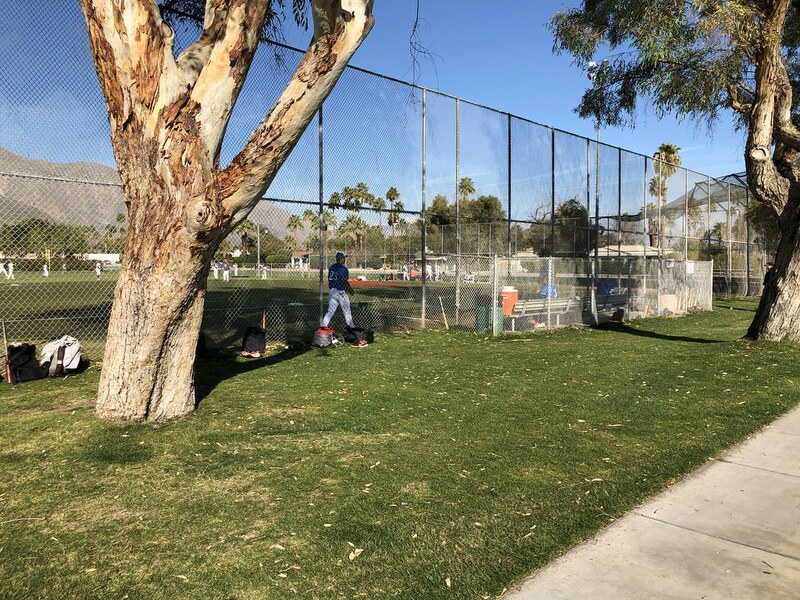 Ivy covers the chain link right-field fence. 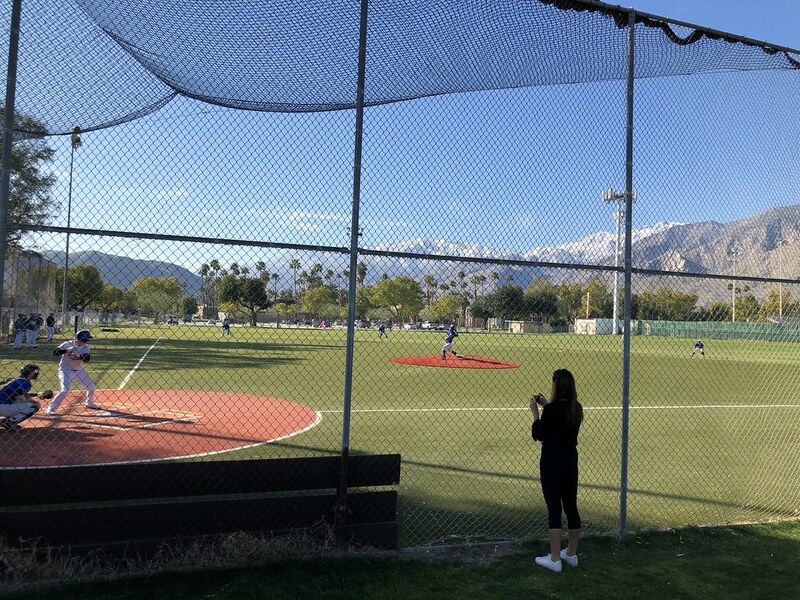 The field has no scoreboard of its own. 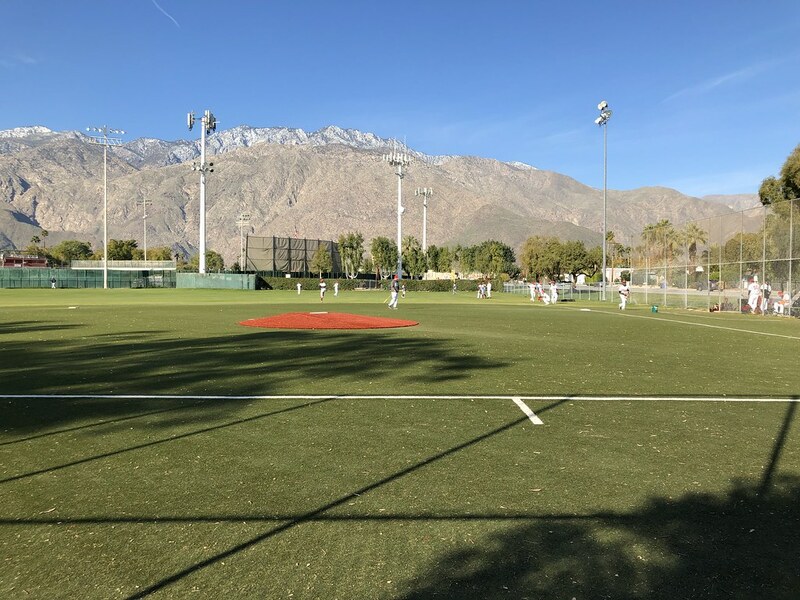 The Palm Springs Power on the field during a California Winter League game at the Palm Springs Auxiliary Field.